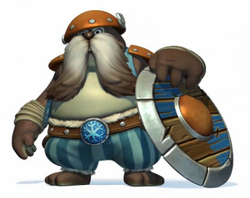 Walbricks are enemies appearing in Donkey Kong Country: Tropical Freeze. They are Waldoughs with long mustaches, brown skin, and a leather belt tied around a pair of blue trousers. They are also covered in orange armor and wield a large, round wooden shield. Walbricks sport longer whiskers than common Waldoughs and Walnuts, obscuring their tusks. 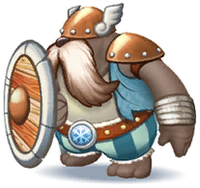 Due to their thorough equipment, Walbricks can deflect any stomp or frontal roll attack. Although their rear sides are unprotected, Walbricks turn around with their shields as the Kongs jump over them to reach the other side. However, the Walbrick can be stunned for a brief period of time by stomping on its helmet. This makes it dizzy and allows the Kongs to attack it from behind with a roll. To defeat a Walbrick, the Kongs have to perform three such roll attacks. Alternatively, they can throw a barrel or charge Rambi into one. Walbricks are uncommon in the game, being found in Mountain Mania, Horn Top Hop, Frosty Fruits, and Blurry Flurry. Additionally, two Walbricks are seen in Big Top Bop, where they flank the battle arena. Bakura Uorasu Bakura Waldough, with "Bakura" being possibly a corruption of 「バックラー」 bakkurā, "buckler"